In April 2008 the existing regulations protecting workers in the music and entertainment sectors from exposure to excessive noise will be replaced by the Control of Noise at Work Regulations 2005 (Noise Regulations). For other industry sectors these Regulations have been in force since April 2006. The European Directive (2003/10/EC) on which the Regulations are based allowed the music and entertainment sectors a two-year transitional period. This recognised that music is unusual as it is noise deliberately created for enjoyment and therefore practical guidelines are necessary to help workers, employers and freelancers in the music and entertainment sectors protect their hearing and safeguard their careers. The Sound Advice web site and Sound Advice HSG 260 publication, were launched on 11 July 2008. They provide practical advice on controlling noise at work in the music and entertainment sectors, and identify good practice to help avoid the harmful effects of prolonged exposure to noise. The guidance has been developed and supported by representatives from a wide range of music and entertainment sectors in Britain, including Environmental Health Officers and the Health and Safety Executive (HSE). The aim of Sound Advice is to control or reduce exposure to noise at work without stopping people from enjoying music, whether you are an employer, freelancer or employee. The following statements are from our supporters, and do not necessarily reflect the views of HSE. 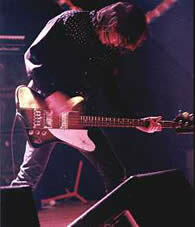 I spent over 20 years touring and recording internationally as bass guitarist with Eddie & the Hot Rods, The Damned and UFO. Eighteen of them were tinnitus free. When I realised my ears were still ringing 2 weeks after a tour had finished, I saw a doctor who referred me to the Audiology Department at University Hospital Wales. The tests showed I had significant hearing loss, tinnitus and the onset of hyperacusis. Against their advice I continued touring, during which time the tinnitus levels rapidly reached such high levels in both ears that I was unable to sleep or concentrate. Additionally hyperacusis rapidly precluded me from going to pubs, restaurants etc, performing onstage became stressful (even with the earplugs available at that time), everyday noises seemed excessively unpleasant and I had to concede defeat. Changing a successful career as a musician was a hard decision to make but I had no choice. Had suitable earplugs been available (eg with a protection factor of 30 dB), I would not be in the situation I am now, having to wear ear protection for everyday life, not least whenever my 2 year old boy gets noisy - which is pretty often! The implications of permanent noise damage go far beyond the working environment - 24 hours a day ringing in both ears, hearing loss, sensitivity to normal noises. And I was one of those who never thought I'd get problems! I think it's a great idea, I am constantly encouraging young djs and lighting guys to wear earplugs. Most djs say that they can't mix as well with them in but they forget that they could wear them for the rest of the evening whilst at the club as they rarely just turn up, play and leave. I suffer from constant ringing as a result of years of dj-ing and I have to live with the fact that I made a lifestyle choice and have to pay the price. However even short exposure to loud levels of noise can cause tinnitus so even bar staff and security deserve some sort of protection. I have tinnitus, most likely from past exposure to musical noise. I notice this as a high-pitch note in my right ear, particularly after playing the piccolo. Luckily in my case it is not constant but it can be annoying all the same! On and off, I also experience a peculiar 'pressure' in my ears, a low-pitch sound like a car driving away. I know it is playing-related as playing can start it off again or make it worse. It can last for weeks and then disappears. Apart from this my hearing, including high pitch hearing, is good. I am keen to protect this for the sake of my career in music. When I do suffer from tinnitus, it can cause me sleeping problems and make me more anxious, and it of course makes me very concerned about my hearing. 110 delegates attended this one-day meeting about the Control of Noise at Work Regulations 2005 as they affect the music and entertainment sectors. It was organised by the Institute of Acoustics Measurement and Instrument Group with support from HSE. Here are some links to websites that appear relevant to noise in music and entertainment. Association of British Orchestras - the national body representing professional orchestras in the UK. British Beer and Pub Association - the leading organisation representing UK brewing and pub sectors. Also has strong links with hospitality and leisure industry groups. British Tinnitus Association - UK charity providing advice, information, education and awareness about tinnitus. Musicians Union - represents 30,000 musicians working in the UK. Advice on health and safety including hearing and their Musicians' Hearing Services. Research - HSE research reports relevant to noise. You can also search for music or entertainment. RNID - UK charity providing information and resources about deafness and hearing loss. Also has Information Line. Theatrical Management Association - Pre-eminent UK organisation dedicated to professional support for performing arts.